Israeli Prime Minister Ariel Sharon has ordered a freeze on all contacts with the Palestinians until their newly elected leader acts against militants. 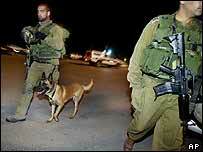 The announcement comes after militants killed six Israelis at a Gaza Strip crossing point on Thursday night. The attack was a blow to Mahmoud Abbas, who was elected on Sunday amid hopes he could promote new moves toward peace. After his election, Mr Sharon called Mr Abbas to congratulate him and said he hoped to meet the new leader "soon". But on Friday hopes for a speedy meeting appeared to be dashed. "Israel informed international leaders today that there will be no meetings with Abbas until he makes a real effort to stop the terror," Mr Sharon's spokesman Assaf Shariv said. A Palestinian cabinet minister, Saeb Erekat, confirmed the news. "We call on the Israelis to resume a meaningful peace process and dialogue because this is the only way to break the vicious cycle of violence," Mr Erekat said. Joint responsibility for Thursday's raid was claimed by three Palestinian groups, including Hamas and the al-Aqsa Martyrs' Brigades, which has links with Mr Abbas's Fatah movement. Three Palestinian gunmen were killed in the attack at Karni, the main crossing point for food and vital supplies into the Gaza Strip, home to 1.3 million Palestinians. Mr Abbas, the successor to the late Palestinian leader Yasser Arafat, said the bombing and shooting raid at Karni, as well as Israeli military actions, "do not benefit peace". He had been hoping to persuade militant groups to agree to a ceasefire. Israeli raids in the Gaza Strip over the past week have also left several Palestinians dead, including a man driving a pregnant neighbour to hospital. The news that contacts have been cut is a huge setback for the new leader - who is not even sworn into office until Saturday - says the BBC's James Reynolds in Jerusalem. Israel has made clear that it will resume contacts if Mr Abbas confronts and reins in the gunmen - but Mr Abbas has based his tactics on talking. His strategy is to talk to the gunmen to try and co-opt them rather than confront them, and to talk to Israel to try to draw concessions from them. But this strategy cannot work if ties are cut off with one side, says our correspondent.